Why did this book not interest me the way it should? I don’t know. Why are railroads so boring? 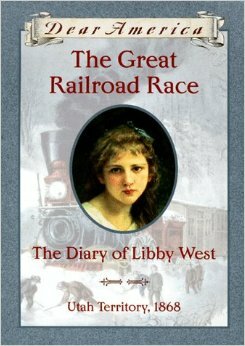 The Great Railroad Race: The Diary of Libby West, Utah Territory, 1868, Kristiana Gregory, 1999. This book is a crime against literature, against entertainment, against fiction, against history, and against joy. 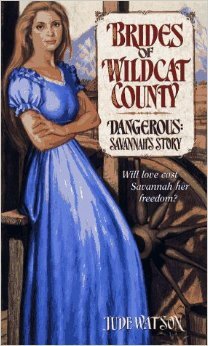 Dangerous: Savannah’s Story, Jude Watson, 1995. This is another one of those books that fall into the illustrious category of “The cover tells you exactly how bad it’s going to be.” And oh, it’s not wrong. It’s so terribly not wrong. I have nothing against a trashy romance novel, but this is barely even a romance novel. So instead of it being “young adult historical romance,” it’s like…barely romance, vaguely historical, and so I guess it’s “young adult.” Good. Already off to a good start, but it’s the kind of “good start” where the car you’re driving has already failed to start three or four times before you finally get it going and then you end up rolled over in a ditch hanging from your seatbelt and cursing violently. I suppose I should have started with this book since it starts off the series, but frankly I don’t care that much, and also this book is so atrociously bad that I would have lost the will to live and therefore to continue my blog. The very first thing you need to know is that basically the first chapter or three is cribbed directly from Gone With The Wind—young, pretty, vivacious Southern belle of a large plantation, who’s been kicked out of several “ladies’ academies,” finds herself married almost against her will to a suitable match whom she hates. Doesn’t that sound familiar? Well, it should, because it’s barely original—in addition to being the first conflict in Gone with the Wind it’s the foundation of like, every single “Southern belle” romance on the planet. Last week I covered one of two companion books on the Vietnam War—this week is the male counterpart. I have Thoughts. 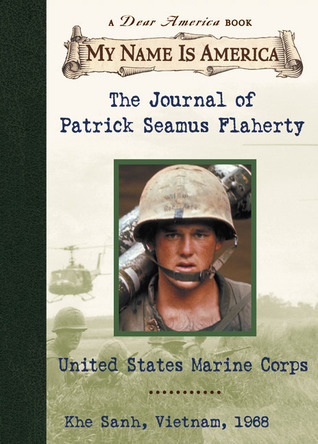 The Journal of Patrick Seamus Flaherty, United States Marine Corp, Khe Sanh, Vietnam, 1968, Ellen Emerson White, 2002. Last week’s Dear America novel, Where Have All The Flowers Gone?is a pretty straight-up diary-style exploration of what it’s like to be a teenager in America in 1968 and having a brother fighting in Vietnam. This one, by necessity, is much more tightly focused and includes boatloads more detail on the war experience. Now, I complain a lot about novels where I feel an author of the same racial background or experience would have brought a better understanding to the book (see Barry Denenberg’s book in the same series on the Japanese interment, or the backlash against Ann Rinaldi’s Dear America book on residential schools compared with the great interest about Ruby Slipperjack’s upcoming Dear Canada novel on residential schools)—but I don’t always feel the same way about men writing about girls or women on boys. Some can be great! Some can be mediocre at best. Does that mean that Ellen Emerson White did a bad job of writing a novel about an eighteen-year-old man? No, it doesn’t. It’s a good book. It’s an interesting book and the fact that both novels were written by the same author lends it a nice air of similar tone that I think helps the story along. I think the major flaw in it, which is that it doesn’t totally read like something an 18-year-old would write, is more the result of White’s intended audience (boys aged 12-15 or so) not being ready for something written with the verisimilitude of an actual Marine. And that’s my main gripe, but if I’m willing to put that aside, which I am, it’s great. Because really, I’m reading this as a YA novel—if I wanted to read Chickenhawk I would do it, you know? How modern can a book’s setting be to still consider it historical fiction? Where Have All The Flowers Gone? 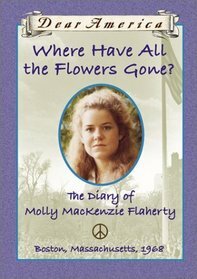 The Diary of Molly MacKenzie Flaherty, Boston, Massachusetts, 1968, Ellen Emerson White, 2002. It’s a little strange to think that the Vietnam War era is definitely considered “historical” now, which is why I think this book didn’t really echo with the audience the way it was intended to. Reading this book is like reading a book about your parents (or, for young readers, your grandparents, which is equally horrifying in its own way), because I think not quite enough time has passed for it to have the interesting “historical fiction” factor. A large part of focus on the Vietnam War was also the presence of media (television—but also print journalism) for the very first time in wartime, and so the Vietnam conflict feels much more “current” than, say, Korea, even though they’re quite close in terms of years. American Girl ran into a similar problem when they tried to release a “historical” doll set in 1974—despite the “cool” factors of bell-bottoms and glasses and whatnot, there’s a lack of not temporal distance but emotional distance in time, which is what I think causes the unpopularity. It’s been fifty years, but I wonder if there’s ever going to be a resurgence in fiction covering that period for that very reason. It doesn’t feel historical in the same way that, say, the Second World War does. Anyway, this book is the only Dear America with a specific companion book, which I’ll cover next week—that being The Journal Of Patrick Seamus Flaherty, United States Marine Corps, Khe Sanh, Vietnam, 1968. Patrick is the protagonist Molly’s brother, and the two books cover very different aspects of the war. I know for a fact that these two books have been used in teaching the era in history classes, which I think is very interesting, but also because both of these books have some great points and some flawed points.